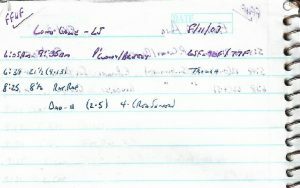 These old fishing reports come in real handy for the Friday Flashback series, kind of nice how that works out several years down the road when just a bit too busy to get on the water. Eases the load on writing as well. Here we go with the original report in its entirety as posted on September 10, 2013. Nothing like a farm pond to break a fishing drought. The start of the school year has understandably and rightfully put a damper on goofing off. Thus I’ve submitted no blog entries for 32 days and logged my last bass at 11:46am on August 1. I guess it must be something about months that begin with the letter “A” as I went 0 for April earlier this year. Hopefully the next couple months or so will provide a few opportunities now that the family is finding some sort of routine amidst work, school, running, soccer, dance and so on. Kicking off my “fall finale” was a welcome trip with Dad to a local farm pond for some good old multispecies fishing. Out of Practice – Having not used my fishing gear for a while, I was a little lost on some last minute prep. Throw in a real busy two year old to keep an eye on and things get a bit wild and prone to distraction. Dad was quick to point this out when I arrived at his house minus oars prompting a return trip across town to my garage. Looking on the bright side, however, at least I didn’t forget the kid instead. Who needs a fish basket? 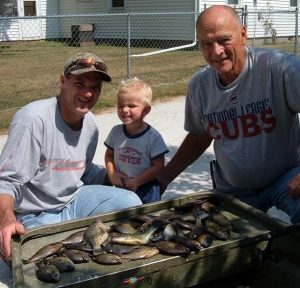 Runs in the Family – Upon arriving at the pond, Dad found that he too had forgotten an item, his five gallon panfish bucket. He combed a nearby barn to no avail so we just went with what we had and tossed our keepers into the back of the boat. Looking on the bright side, however, Dad commented that we certainly had plenty of room in the 12’ fish basket for some cooperative fish. Just Like Riding a Bike – Seven minutes into casting I reeled in proof that I still knew how to fool a bass. 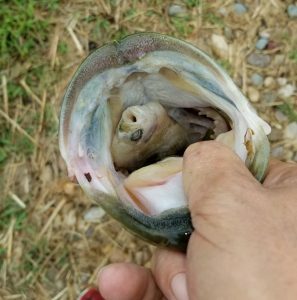 Seven minutes later I boated bass number two which engulfed my crankbait as soon as it hit the water next to a fallen tree. The 2-2 was a nice fish to break the bass drought and fell one once shy of the pond record, a 2-3 that I caught on September 10, 2010 on a wacky rigged Senko (interestingly the first bass I ever caught at the pond). We made roughly one lap around the pond pursuing bass from 9:30-10:45am winding up with five fish (all released). 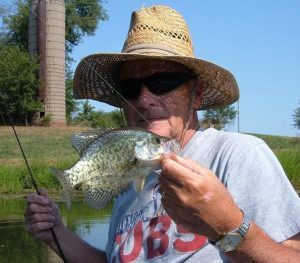 Multispecies day – Crappie? Check! 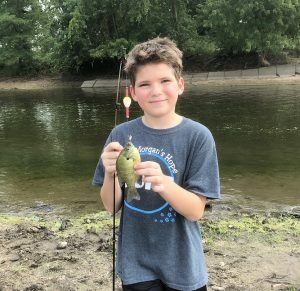 Round Two – The second half of our trip focused on pursuing some panfish with waxworms hung from a bobber. Dad has a couple productive spots where he plants his lawn chair for solo outings so we hit one only to find that the fish weren’t to be found. Moving around a point he began to pick up a handful but felt we should try a consistent area near the dam. His suggestion paid off and we spent our final thirty minutes hooked up on a pretty solid bite. 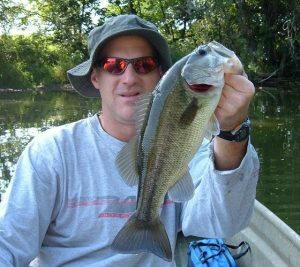 The Title – Back when we used to target whatever would bite our Beetle Spins, we’d award an unofficial “Species Title” to the angler who reeled in the most different fish. Dad and I spent much of this trip knotted at two apiece with a bass and a bluegill before his late additions of a crappie and a redear gave him a runaway victory. 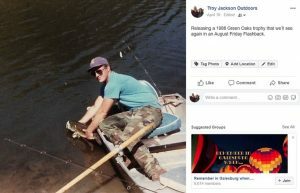 He’s also tangled with several good catfish on his ultralight over the years but none of them paid a visit this time around. In the interest of honest reporting I will also admit that he soundly whipped me for the overall catch title as I only managed seven bluegill to his twenty six panfish. The Taste – Part of the reason for the trip was to obtain some fillets for a lunch event at my workplace yesterday. For many years, staff members have put together a more or less annual feast called “The Taste of the Mary Davis Home” where employees bring in dishes of their choice to share with the kids in our charge. Life in a detention home certainly has its share of challenges, frustrations and stressors and sadly for a number of these kids, things may not be any better at home. Therefore, it’s always rewarding to have an event such as this to put life aside for a bit in favor of a tray, two bowls and two paper plates for most that are heaped with a little bit of everything. Dad’s contribution of bluegill and crappie fillets was met with several compliments from kids and staff alike and I’d like to say thanks for helping us out. All involved helped to create an atmosphere with a lot of smiles, ample debate on which dishes ruled the day and, of course, plenty of kids (and a few adults) clutching their stuffed guts yet still having room for that last cookie. 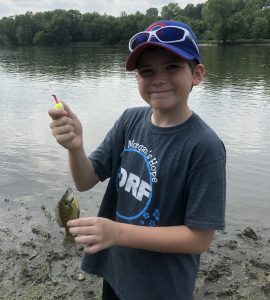 Although Zac didn’t tag along on this outing, showing off the catch is another important piece of a father-son fishing trip. Okay, maybe a bit longwinded for a trip without any true trophies but it reinforces that there’s more to the trip than the catch. For better or worse, that’s how I fish. That’s also how I write and after a month without a blog entry you should’ve seen this coming. 4. Your Song – Elton John (1970) – One of the earliest hits from a legendary performer but how about the guy who wrote the words? 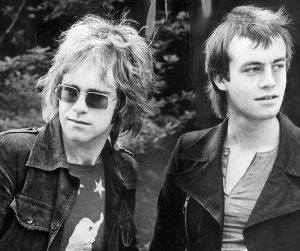 Shout out to Bernie Taupin for his role in this partnership. 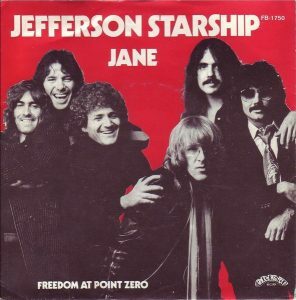 Many characters, many stories and a whole lotta love songs including this favorite. This one is endearing and enduring, gets better the older I get. And how cool that Taupin penned these lyrics before he reached his 20th birthday. Simply amazing. 3. 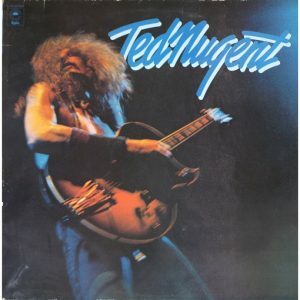 Stranglehold – Ted Nugent (1975) – Does it get any more fun than a rocker from Uncle Ted? 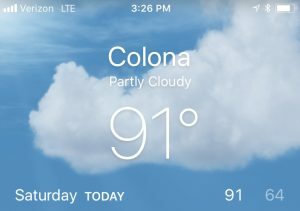 A nasty groove to get things warmed up before you get hit with “Here I come again now baby, like a dog in heat.” Are you kidding me? And there’s still seven and a half more minutes of rocking to go. I don’t care if I sound old but they don’t make ‘em like that anymore. 2. 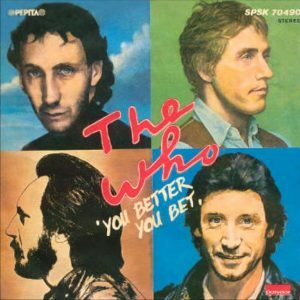 You Better You Bet – The Who (1981) – I’m a fan of this pretty fabulous foursome that often seem to take a backseat to another fab quartet as well as a batch of Stones.Gotta give Roger Daltrey some props on this one too. Solid, solid frontman who could always “sing a razor line.” Great stuff here and one of the first videos to be played on something called MTV. Hey, haven’t done one of these for a while and too busy to fish so here we go. 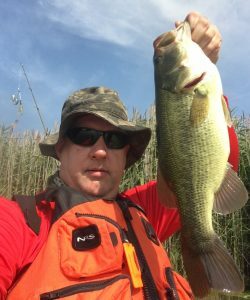 This one was actually compiled during my last solo bass fishing outing back on July 28. Too busy to write, too. 10. 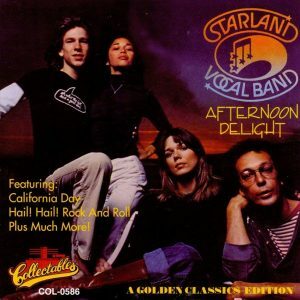 Afternoon Delight – Starland Vocal Band (1976) – Okay, so gotta make the short list of dirtiest songs of all-time and extra fun because it was one of my favorites as an eight or nine year old kid back in the Bicentennial. Even has a fishing verse tucked away in there. But nowadays, with a 51-year old body and four kids running around the house all the time, a little afternoon delight is more like a nap. 9. 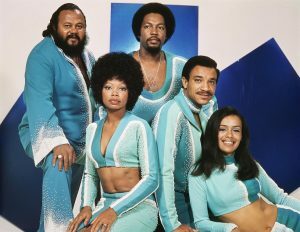 Aquarius/Let the Sunshine In – The Fifth Dimension (1969) – Always dug this groovy ditty from when I was way too young to actually recall its original release. Must have caught it on the airwaves and seems like there was an album around the house. And what a beautiful lady and voice in Marilyn McCoo. Still a cool cut nearly 50 years later as my oldest daughter, Helena, took a liking to it when featured as a tune in a recent performance of her Quad City Music Guild group. 7. 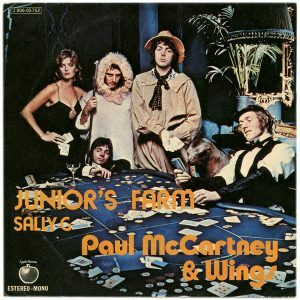 Junior’s Farm – Paul McCartney & Wings (1974) – Kind of rock and roll meets Dr. Seuss. I really have no idea and it really doesn’t matter. Good old Sir Paul with a battery of hooks so no surprise that this one always catches my ear. Quite a cast of characters including an Eskimo, a card dealer, a politician and Ollie Hardy. And how about trios of rhyming words like “Parliament”, “President” and “cement” as well as “sense”, “fence” and “pence”? How fun would it be to have such lyrical talent? 6. 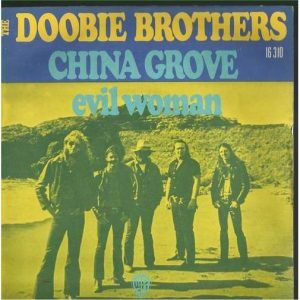 China Grove – The Doobie Brothers (1973) – This whole internet thing can get distracting, weird and even a bit addictive but it’s totally worth it when it comes to song lyrics. Anybody else out there been singing the wrong words or substituting some runs of gibberish for decades? “Samurai swords”, huh? Makes perfect sense, sorta. 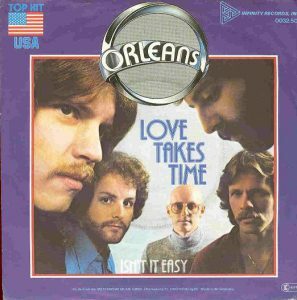 At any rate an outstanding piece of 70s classic rock from a band with a little bit of everything sonically thrown into the mix. 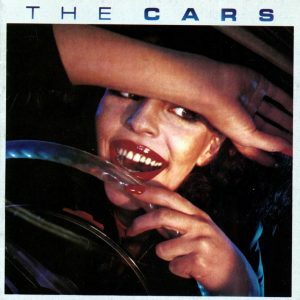 Hits you right from the start, ends without much warning and keeps driving all the way in between. So here we are, back to school for a week or better depending on the kid and, as always, wondering just where the summer went. A summer seemingly so brief and absolutely so busy that it slipped by without the normal camping and fishing we usually manage to squeeze in. Oh, but we did get to work in just a few other things. Like baseball, band camp, Tae Kwon Do, oboe lessons, color guard camp, birthday parties, tutoring, slumber parties, summer camp, a week of work on the road, a cleaning gig, dogsitting…you get the picture. So, when my boy, Jayce, recently asked about getting out it was pretty much a no brainer as I knew he’d been chomping at the bit for quite some time. 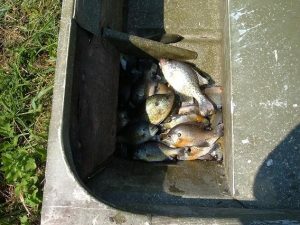 We hit the local bait cooler for some waxworms for panfish and dew worms for catfish. We also picked up a missing ingredient for a doughball recipe to see if we could fool a carp as well. Finally, we grabbed a couple items of terminal tackle and a soda to complete our gear grab. Armed with a doughball, “Papa makes them different” says Jayce. After completing doughball prep in the kitchen and tackle rigging at the tailgate it was off to our potential multi-species destination at the confluence of the Hennepin Canal and the Rock River in Colona, Illinois. With feigned reluctance, Jayce opted to head for home and I had to grin inside as I saw the glint of relief as I seconded his decision to hit the road. Hey, 30 minutes prowling the riverbank was just fine as such adventures are always about more than casting, reeling and catching. 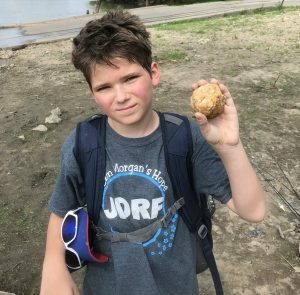 After all, we’d revisited the practice of making doughballs (Jayce informed me that Papa makes them with some different stuff), dumped all of our waxworms in the mud and listened to the Cubs on my trusty ancient transistor radio as we watched our poles. Throw in two fishing buddies shooting the breeze in an old pickup truck on the way to and from the fishing hole and the trip was a winner no matter the duration or the haul. 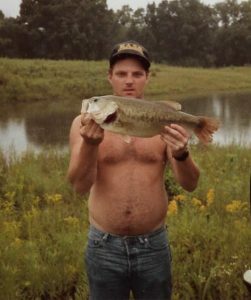 We head back 30 years this week with a quality bass from what was once a quality fishing hole. 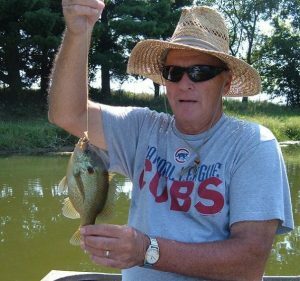 Green Oaks, Knox College’s biological field station, is located a few miles south of Victoria, Illinois in close proximity to another contemporary fishing haunt, Little John Conservation Club. 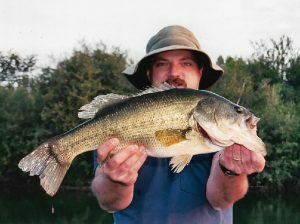 I still fish Little John all these years later but my days on Green Oaks Lake are long gone. 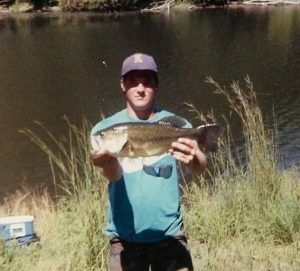 But back in my college days, it was a regular weekend bass fishing stop as well as an off the beaten path camping spot. A perfect getaway where a group of college buddies could enjoy a few beers around a campfire often resembling a bonfire. 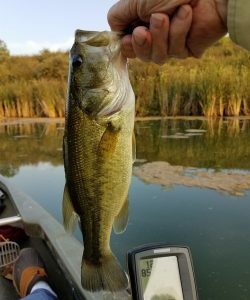 Today’s featured fish came from a spot on the lake that we called “The Forbidden Zone” due to it being designated as off-limits for watercraft. And yes, I am posing in a beached watercraft for the release below which is all I will admit to although I suspect that the statute of limitations has long passed. 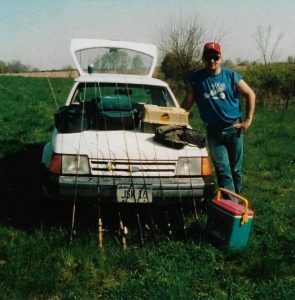 “Woody” (read on for more details) posing with our bass fishing arsenal near one of his grandma’s ponds back in the early 90s. Got several tales from this area that likely will show up another day in a flashback so for today we’ll just take a look at who this “Woody” character is and how I wound up on the banks of his grandma’s fishing holes 25 years ago. Scott “Woody” Woods and I would have first met sometime in the early 70s I suppose when our dads (Mike Woods and Terry Jackson) played more than a little fastpitch softball together. Under their influence, we each also took a liking to baseball and although we grew up playing ball in neighboring communities, our paths would cross again thanks to the sport. 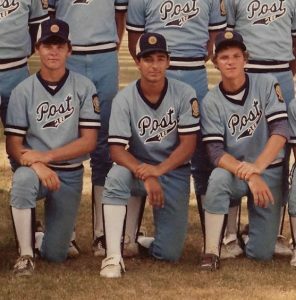 1983 Galesburg Legion Post 285 – Woody on left, me on right, flanking Woody’s future Monmouth College teammate and one of my oldest buddies, Arnie Gonzalez. Woody would star on some very successful Knoxville High School baseball teams in the early 80s while I was enjoying time covering various parts of the infield at Galesburg High School. Our local Legion Post 285 drew players from both schools so in 1983 Woody and I would have a chance to be teammates on the squad. A fun clipping from 1986 of Woody and me in action as rivals at our shared position on the diamond. Fast forward a few years later and we would find ourselves as dueling third baseman in the local college rivalry. 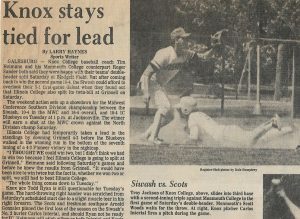 Woody manned the hot corner for the Monmouth College Fighting Scots while I did the same for the Knox College Siwash. Definitely some heated competition as the teams have never really liked each other. Perhaps even worse than a Cubs-Cards feud, just on a smaller stage. Maybe more like the Hatfields and McCoys (a little less redneck though as that is where another division opponent, Illinois College, came into play, just kidding, sort of). After putting our college baseball days behind us, Woody and I would wind up as co-workers for about ten years at a Galesburg, Illinois manufacturing plant, National Seal Company. And there it was, that Woody mentioned word of the good bass fishing at his grandma’s farm. Fortunately, those Knox-Monmouth days were far enough behind us and I got a few invites to battle those bass. And the one pictured above comes from 25 years ago this week, hard to believe how time flies. 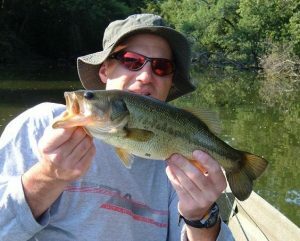 More Fulton County bass via a summertime favorite, the buzzbait. Always exciting and dangerously addictive when you land a couple of this caliber. 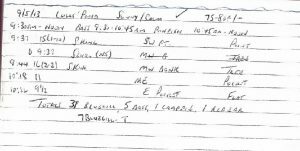 Angler Comments: I didn’t get on the water as early as I had planned so may have missed a couple of early daylight bites. Only had three bites on the day all on the buzzbaits. 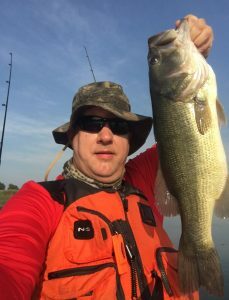 The dog days of summer can present a challenge when trying to find some cooperative bass, particularly for a guy who has a tendency to stay shallow. In addition, I’ve long been addicted to warm weather topwater presentations so I often get stuck in that rut as well. So, the following excerpt from a report submitted back on August 21, 2003 should serve as a lesson that I need to try a little something different every now and then. August 11 – Dad and I fished at Little John from 6:00-9:30am and only boated four bass. Our only “keepers” were a pair of bass that weighed a total of 7-2. I posted a 4-13 while Dad caught a 2-5. My fish came on a jig (brown/orange glimmer) with a split double tail trailer (black) as I worked it through a saddle (a slight depression between a pair of points that run towards each other). Following a light tap, my line went a bit slack and I reeled the line up tight and felt the fish swimming towards me. Setting the hook, I knew I had a decent fish although I didn’t envision a near five-pounder. Dad did an expert job on the dipnet as he nabbed the fish in mid-air following a spectacular jump at boatside. This bass made my personal Top 10 as the ninth largest bass I’ve ever caught. Dad caught his 2-5 on a Mann’s 4- (red shiner) as he worked a trough between a mid-lake hump and a narrow finger. 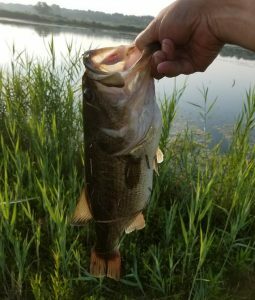 Half a dozen more bass join our project since the July stat update and we get our first angler topping the 20-pound mark for 2018.